The Customer Detail Report is helpful in finding specific charges and payments, seeing which invoices were selected for specific payments, or troubleshooting in general. 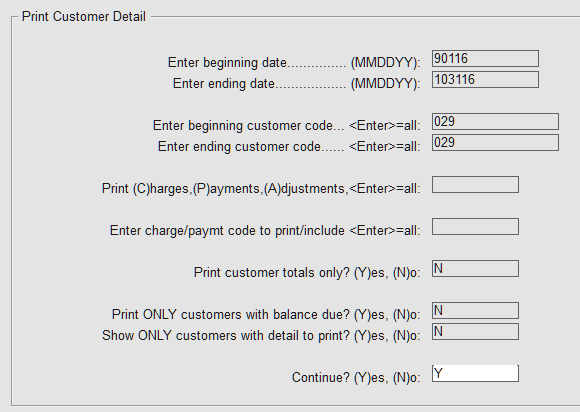 From the Direct Bill or City Ledger menu, select "Print Customer Detail". You can print the report by Customer Name or Customer Code. If you are printing only one customer or a range of customers, select "Sort by Customer Code". Enter the beginning and ending dates. 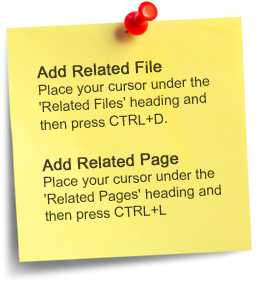 Enter the beginning and ending customer codes (or press Enter to print all). Answer the other fields as appropriate. 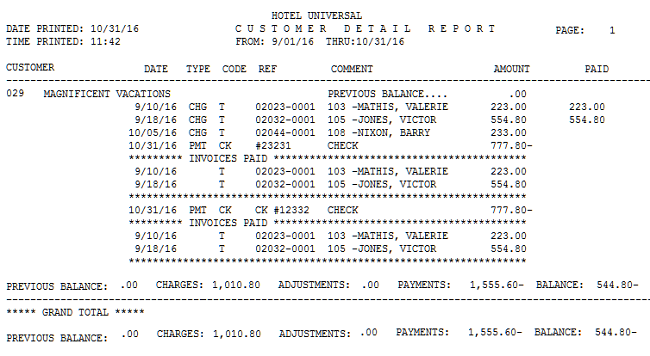 Below is a sample customer detail report for customer 029 for date range 9/01/16 through 10/31/16.